My husband’s Argentinian traditions run deep. Growing up, he had an asado (equivalent to a steak and chicken BBQ complete with all the animal’s innards) with his family every Saturday. Every.Saturday. That’s like a ton of meat. Over the years, we’ve had our fair share of asados as a family and with friends, but nowhere near the frequency he had them as a kid. He dreams of the day when he can have his own asador in the backyard and grill every Saturday just like the old days. A guy can dream. 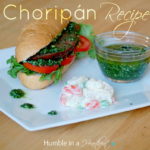 Of course his family would eat more than just meat at their asados. The side dishes were muy importante (that’s “very important” for those who don’t know Spanish speak) as well. 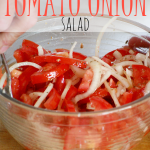 They ate this Tomato Onion Salad often to accompany any BBQ because it’s that good. 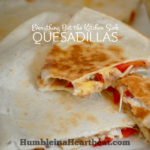 It’s a cinch to pull together last minute and really easy on the budget. 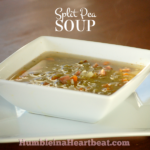 Normally I would only recommend a recipe on here that I had tried several times and really loved. 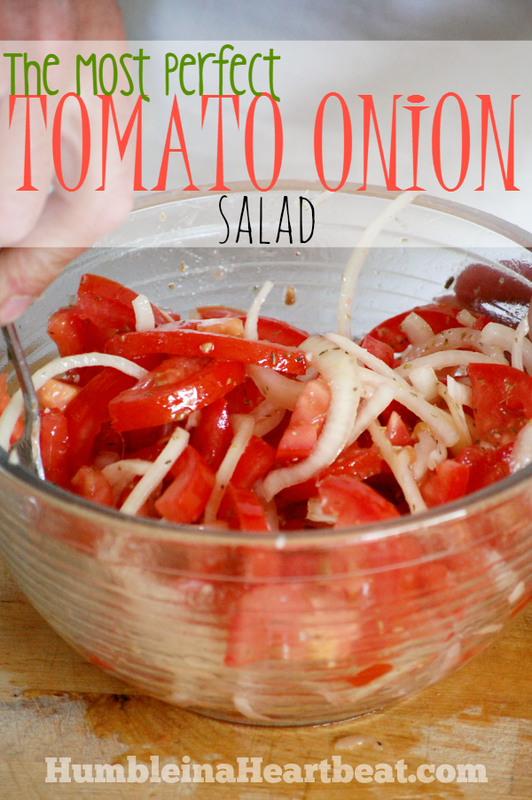 Tomato Onion Salad is an exception. I don’t eat it. At all. While I have learned to love onions and eat them in almost anything, I still cannot eat raw onions. I am getting closer and closer, but I just can’t do it quite yet. 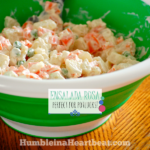 So the only reason I am posting about this salad is because it always gets rave reviews from anyone that tries it. 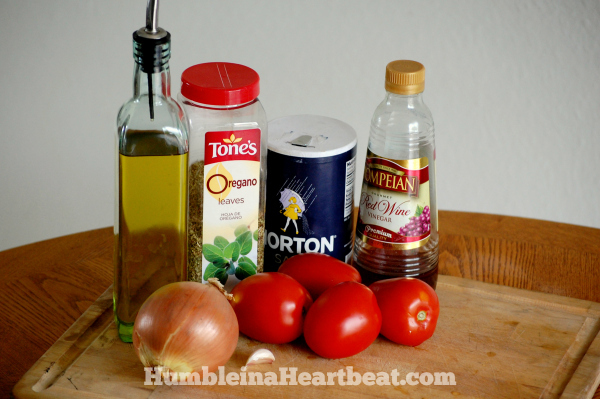 Since I have never tried it, I’ll have to guess that it is a great salad because the juicy tomato and crunchy onion come together with a garlicky, oregano-flavored dressing that is the perfect way to end any summer evening. My husband swears that the way you cut the onion makes a huge difference in how this salad turns out, so be sure to refer to the above picture tutorial for assistance in cutting the onion just so. 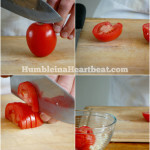 Same goes for cutting the tomatoes. If you have it, kosher salt might be a better choice over table salt. We didn’t have any kosher salt when I took the pictures, but I prefer to use it since it seems to bring out the flavors more. 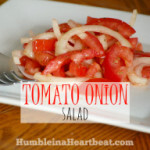 Tomato Onion Salad is the most perfect side dish to any BBQ and it won’t put a dent in your wallet. What’s your favorite meat to eat at a BBQ? 1/4 tsp vinegar balsamic, red wine, white, etc. 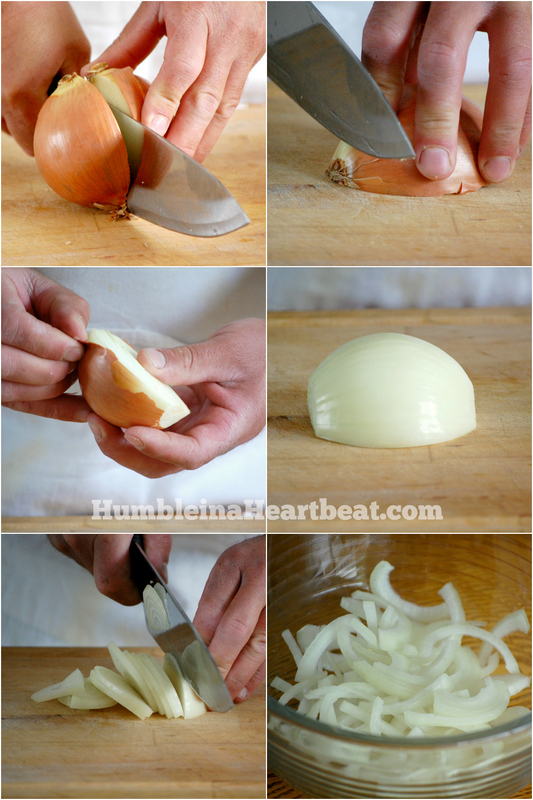 Cut the onion in thin slices and place in a medium bowl. 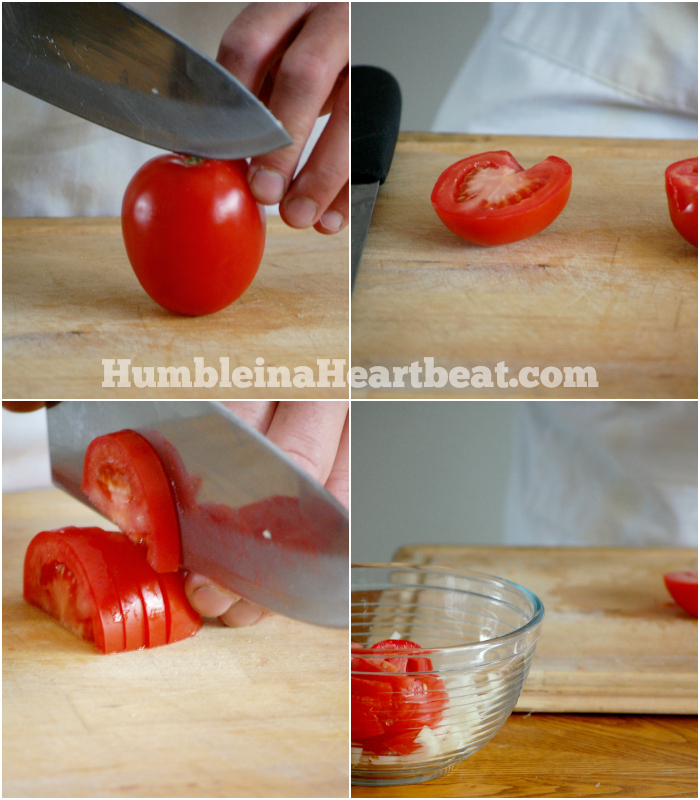 Cut the tomatoes in slices as well and add to the onions. 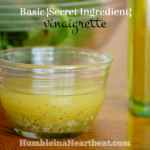 Put the olive oil, vinegar, oregano, garlic, salt, and pepper in a small glass bowl and whisk together. Pour over the tomatoes and onions. 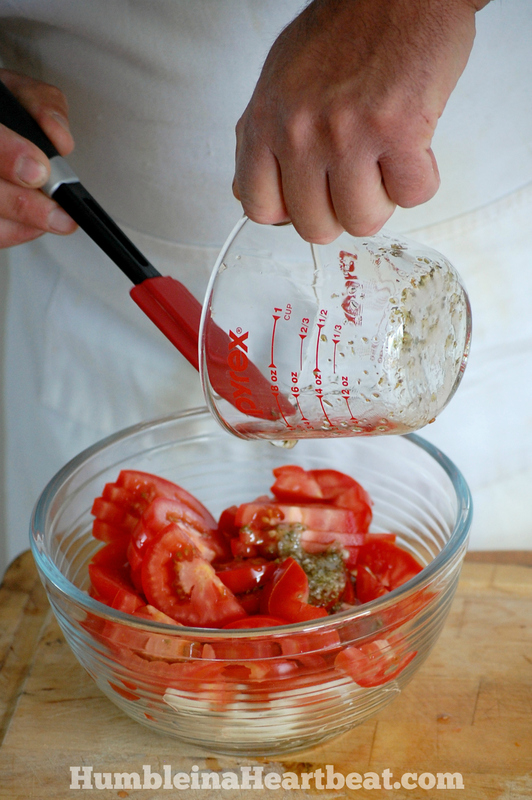 Stir together in a circular motion so all the veggies get covered with the dressing. 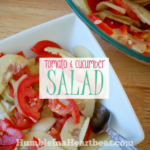 This salad is best eaten right away, but you can certainly store any leftovers if you don't mind eating tomatoes that are softer. I agree with your husband 100%. Of course, I’m fron Argentina too ?. 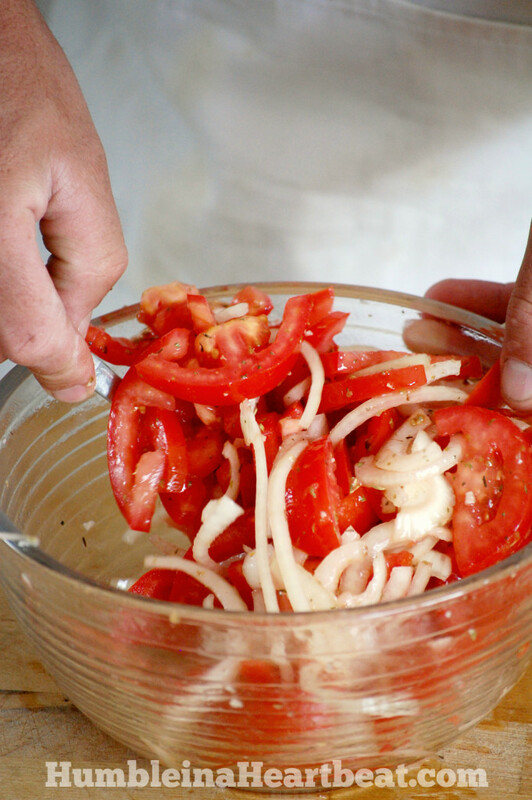 My Mami used to make this salad but I can’t remember what to do so the onions won’t be so acidic. Any tips? 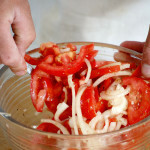 Some chilean friends treat the onions with sugar for an hour or so before rinsing it and adding the tomatoes. Haven’t tried it yet? Hello Giovanna! My husband has never done anything to the onions to make them a bit more mellow, but I just came across this article that might help: http://blog.blueapron.com/how-to-tame-an-onions-bite/. Thanks for stopping in! I made this salad tonight for supper. We had it with smoked BbQed turkey thighs. The salad and the turkey was very good! I will make this salad again.